Buckingham County Murder | slate river ramblings . . . .
Arvonia, Va., December 3—Officers and citizens of the upper end of Buckingham county are putting forth every effort to locate and capture the bold thief and burglar who so brutally murdered the old Confederate soldier, Curtis Branch, at Manteo, on last Monday night. The reward offered by the Governor, at the instigation of Commonweath’s Attorney Edmund W. Hubbard, has been supplemented by the county Board of Supervisors until the total amount offered is now $350. Besides the work of local authorities, the United States government is expected to send a detective to help ferret out the crime, as the robbery which followed the murder, included the looting of the post-office at Manteo and the carrying away of post-office funds and stamps. As yet those who are working upon the case are unwilling to give out any information, though it is known that there are suspects of the crime. The murder was the most brutal and revolting known in this section since the two Stewart brothers were murdered and burned [at] their home three years ago. How about 1908 my two great uncles, William and Charles Thomas. I think they were involved in an incident around Arvonia around that time. so how ’bout those poor Stewart brothers? I couldn’t find anything in a quick search. 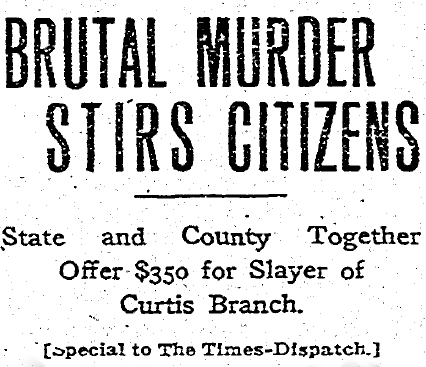 Buckingham County Murder: Manteo Killing, Part I | slate river ramblings . . . .
Curtis Nunley Branch, C.S.A. | slate river ramblings . . . .